The ads1115 domain creates a global hub so that you can later create individual sensors using the ADS1115 Sensor Platform. To use this hub, first setup the I²C Bus and connect the sensor to the pins specified there. address (Required, int): The i²c address of the sensor. See I²C Addresses for more information. id (Optional, ID): Manually specify the ID for this ADS1115 Hub. Use this if you want to use multiple ADS1115 hubs at once. In order to allow multiple sensors to be connected to the same i²c bus, the creators of this sensor hardware have included some options to change the i²c address. If the address pin is pulled to GND, the address is 0x48 (Default). If the address pin is pulled to VCC, the address is 0x49. If the address pin is tied to SDA, the address is 0x4a. If the address pin is tied to SCL, the address is 0x4B. 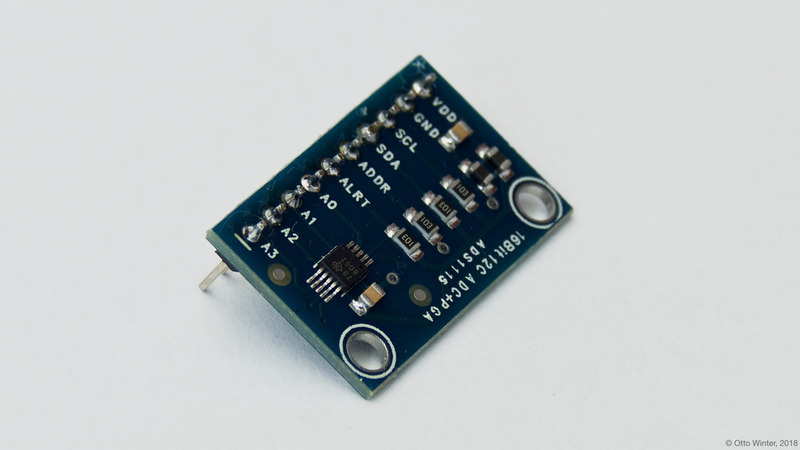 The ads1115 sensor allows you to use your ADS1115 sigma-delta ADC sensors (datasheet, Adafruit) with ESPHome. First, setup a ADS1115 Hub for your ADS1115 sensor and then use this sensor platform to create individual sensors that will report the voltage to Home Assistant. multiplexer (Required): The multiplexer channel of this sensor. Effectively means between which pins you want to measure voltage. gain (Required, float): The gain of this sensor. name (Required, string): The name for this sensor. ads1115_id (Optional, ID): Manually specify the ID of the ADS1115 Hub you want to use this sensor.